The Thanksgiving weekend is over, and I hope it was a happy one for all of you. Husby and I had a cozy little dinner with just the two of us. Now that we celebrate the day as a twosome we serve ourselves something other than a giant turkey, because there’s only so much two people can do with a twelve pound turkey before getting sick of it or developing narcolepsy due to excess tryptophan. This year we had a nice little pork loin with a cranberry barbecue glaze and a bunch of other good stuff to accompany it. We also had a very nontraditional dessert ~ applesauce cake with a spiced cream cheese frosting. 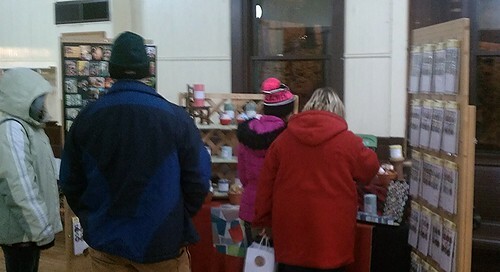 Black Friday was very leisurely for us as we spent the day at the Taylors Falls Depot selling my wares. There was a crowd shopping, but there was no screaming, clawing, or trampling. 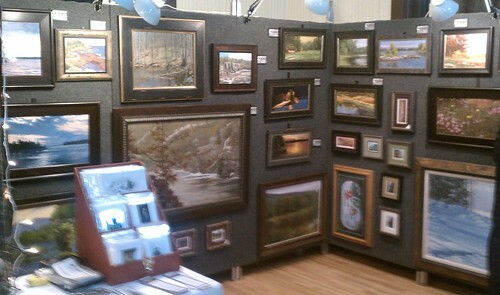 Joyce and Doug’s booth filled with beautiful original paintings. A friend of one of the vendors stopped by and it turns out she’s a professional pianist. It was so nice of her to play some music for us for free, although I’m pretty sure the out-of-tune piano was bugging her to no end. Despite that, she played beautifully. 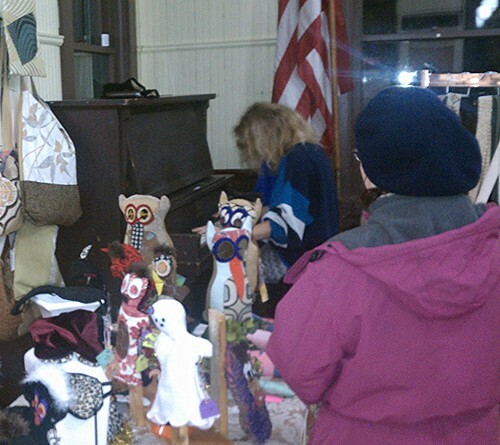 One of the shoppers loved the music so much she lingered to sing along to the Christmas songs. Live music from a real professional. What a treat! Of course I was thrilled to meet some new customers and see lots of returning customers. I was especially happy to meet the lady who loves beeswax so much she bought every beeswax candle I had. Woo Hoo! I appreciate all who stopped by my booth to pay me a visit or buy a thing or two for themselves or for gifts to give this Christmas. With the Thanksgiving weekend behind us I foresee a whirlwind of activity coming our way. I’m looking forward to the festivites and preparations. Let the Christmas season begin! And I hear we have a week more of the season this year. I hope it all works in your favor! Thanks, Lorna ~ I hope you have a festive holiday season too! Good luck with Christmas season festivities and sales! Thanks Cindy! I hope you have a wonderful season too ~ stay warm!